You are here: Home / About American Cane Self Defense / What is American Cane Self Defense? What is American Cane Self Defense? What is American Cane Self Defense and What Makes it Different? American Cane Self Defense(ACSD), is the premiere reality based tactical Cane Self Defense system worldwide. While others have introduced the Cane within the realm of martial arts, ACSD is the first to introduce the Cane as a stand-alone, tactical self defense system. 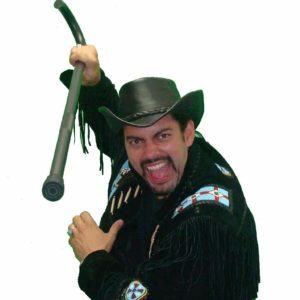 The system was developed and introduced by founder and American Cane Self Defense pioneer, Joe Robaina. Robaina who in over 3 decades attained master ranks in various martial arts is also a Regional Director for C.O.B.R.A (Combat Objective Battle Ready Application) Defense International, a global company specializing in self defense and personal safety. Robaina introuduced COBRA reality based concepts and LIVE scenario training to impart life saving Cane Self Defense responses in the nerve system under the stress of an actual attack. This unique approach to training sets the ACSD apart as the world’s #1 Tactical Cane Self Defense system. Cane Self Defense: You learn the cognitive, verbal, and physical Cane Self Defense skills that allow you to respond without freezing up under stress or having the Cane taken away from you, so you can save your life and protect your loved ones. There are various courses ranging from the foundational 52S course that gives you the ability to command respect with the Cane with just 2 hours of training to the scenario based, COBRA 10 Week Academy to the Cane Morph that empowers you to survive multiple assailants. Most courses are offered to you both live and home-study making it convenient to learn from the comfort of anywhere. Combat Cane Spinning: Also known as maneuverability or freestyling, is a fast growing art/social sport with tons of anti-aging benefits. This is the flashy twirling, spinning and “tricks” you may have seen Combat Caners doing in a fun, social atmosphere. Caners range from ages 7 to 97 and the hallmark of ACSD Combat Cane Spinning is that the maneuvers have combative applications. ACSD introduced many of today’s manevers and skills known the Robaina-Line of Combat Cane Spinning to differentiate it from other styles of Cane maneuverability. ACSD created the Combat Cane Spinning Society for training, rank advancemnet, events, and ensuring the presevation of the art. Cane-Fit Functional Fitness: The Cane-Fit system offers a unique method of exercise that improves cardiovascular endurance, strength, flexibility, hand eye coordination, balance, ambidextrous skills, trains the brain and in an enjoyable group class or private setting. The training is appropriate for all ages and can be modified to accommodate physical injuries. Instructors are all certifed in the method and Classes are offered live or via video. CaneSelfDefenseUniversity.com offers the complete 24/7 ACSD training online. “Dr. 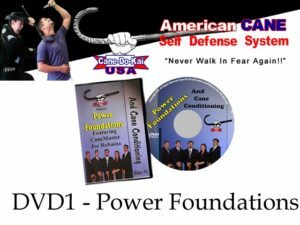 Joe, a pioneer in this discipline, has recently put together a six-disc DVD Cane Self Defense training program that is probably the best in the world. Compared to other video training programs I’ve observed his techniques are uncomplicated, straight-forward, easy to learn, and the basics can be mastered with minimum of training time. Cane conditioning using double canes. Five Basic Power Shots Template. Although this series has provided insights into real American Cane Self Defense for practitioners and the interested public alike, it is basic groundwork that lays the foundation for future material. Five To Survive is the newest training course from American Cane Self Defense and is the first to incorporate reality based cane scenarios that could make the difference between you being a victim, or a victor. The ACSD cane is a powerful tool when it comes to self-defense. In fact it’s a Bazooka, but you have to know and always be prepared to quickly harness that power because a criminal threat is going to likely be one that you won’t see coming. Criminals aren’t in the habit of sending advance notice. In fact the biggest advantage they have is the unsuspecting victim. Criminals are professionals at their craft and they’ll scope you out in advance to determine when the best time and place is going to be for them to try and separate you from what they want. Their shock and awe tactic is meant to take you by surprise so you don’t or can’t properly respond or defend yourself. They’re counting on you not being prepared.